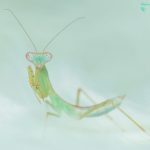 Hierodula sp blue Malaysian Blue Mantis is a medium sized Hierodulka species, but is distinctive for its stunning blue and green colouring, with beautiful orange and yellow markings on the inner femurs. Hierodula is a genus of praying mantises found throughout Asia. Many species are referred to by the common name giant Asian mantis because of their large size.